Anasazi Architecture and American Design is a journey through Chaco Canyon and Mesa Verde with leading southwestern archaeologists, historians, architects, landscape architects, artists, and urban planners as guides. 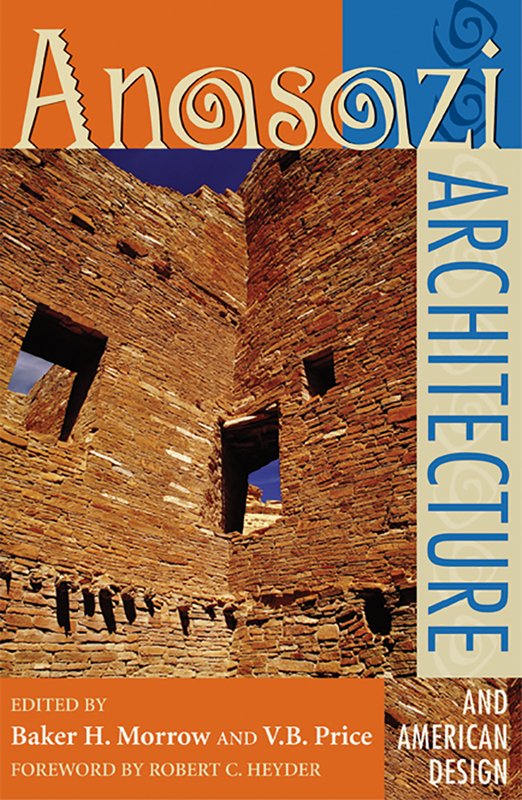 In sixteen chapters, the volume's twenty-two essayists identify Anasazi building and cultural features related to design and site planning, cosmography, mythology, and ecology, then expertly balance their observations of past architectural and cultural achievements with suggestions and recommendations for design practices in the present. Among the contributors are Santa Clara Pueblo architectural theorist Rina Swentzell; architects Tony Anella and Stephen Schreiber; historian Richard Ellis; art historian J. J. Brody; archaeologists Stephen Lekson, David Stuart, Michael Marshall, John Stein, and Dabney Ford; urban planners Theodore Jojola, Judith Suiter, Stephen Dent, Barbara Coleman, and Paul Lusk; and artist Anna Sofaer, founder of the Solstice Project. Baker H. Morrow, FASLA, is a landscape architect in Albuquerque and a professor at the University of New Mexico. He is the author or editor of several books and is also the founding director of the master's program in landscape architecture at the University of New Mexico.